After a suggestion from my brother Lutz we went up to Gunung Raya (pictures here not sorted yet) the highest peak on Langkawi and it was well worth the trip. Because it is not season yet, we were all alone. 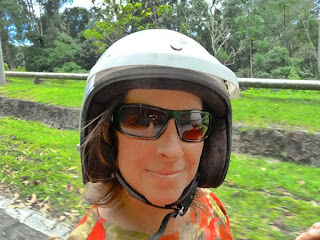 There was not one car or bus anywhere which made the ride with the motor bike very pleasurable and we were able to see wild monkeys and all sort of different birds. The jungle noise was very impressive too and once we reached the top and went up the tower costing (10RM =2,50€ coffee or tea for free) the view was amazing.